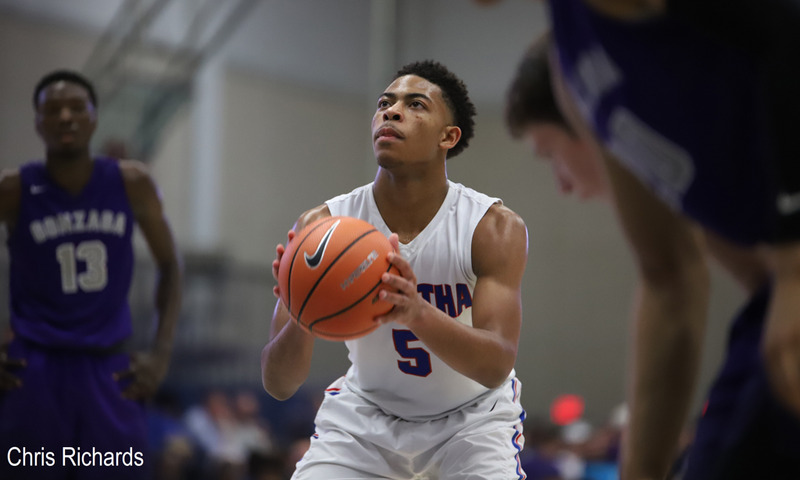 The DeMatha Catholic Stags are the returning WCAC Champions and are looking to keep it that way looking toward the 2018-2019 high school season. Head coach Mike Jones returns to this season with a stacked roster that can attack opponents in multiple ways. What stands out the most about their team is how well balanced they are. They have elite guard play with Villanova commit Justin Moore, Charlotte commit Jahmir Young, four-star junior wing Earl Timberlake and senior Josh Wallace. Their frontcourt includes five-star junior Hunter Dickinson and high major junior prospect Paul Smith. It’s safe to say Mike Jones has a lot to work with this season, and it should lead to plenty of wins for the Stags. Villanova commit Justin Moore is this team’s star this year. Moore is as steady as they come and proved why he is one of the best guards in the country last high school season. Moore, who sat out his sophomore year of high school due to an ACL tear, return his junior year to lead his team to a WCAC championship. Moore has an excellent feel for the game and has the ability to go and score more than he does, but always puts his team first. With his leadership and ability on the court, Moore will be huge for the Stags this year. Impact Players…DeMatha Catholic has a lot of them this year. As mentioned before it all starts with senior guard Justin Moore. Moore will be complemented with senior guard Jahmir Young and Josh Wallace. Young knows how to run an offense and Wallace will provide big minutes coming off the bench. Junior wing Earl Timberlake is one of the best 2020 prospects at his position with his elite athleticism and defensive play. Junior center Hunter Dickinson is as skilled of a big men as there is on the high school level and junior power forward Paul Smith has an outstanding motor. It would also be foolish to forget about senior Brown commit Carsten Kogelnik who Mike Jones will turn to for production off the bench. Any team can be beaten, but the Stags are going to be a tough team to take down this season. With their depth, talent and coaching, they are the favorites to win the WCAC championship, and they should have a great chance at qualifying for GEICO Nationals. Jones knows how to coach teams this good and is more than capable of leading this group to achieve all of their intended goals. This all being said the WCAC is debatably the toughest conference in the country and is capable of giving any team trouble no matter how talented they are. It’s going to be a good year to follow DeMatha Catholic as they will have a big target on their back due to how good they are this season.